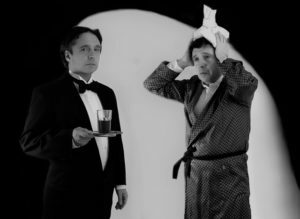 A theatrical offering in the style one of the most widely-read humourists of the twentieth century, Wooster Sauce showcases actor John Huston in both the character of capable Jeeves, as well as Jeeves’ hapless but likeable master. Huston’s considerable acting chops are showcased in this cleverly-written, truly humorous piece of theatre. His characterizations are spot-on, and he is clearly enjoying himself onstage, as both characters. The audience laughed, chuckled and groaned, and had a wonderful time overall. Huston shines in this delightful show, a highlight of the Edmonton Fringe.